Cooperative Learning 365 has officially exceeded the quarter of a million mark! Thanks again, and thanks for all the fabulous comments that were left. 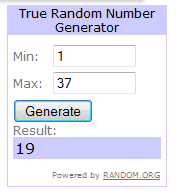 The handy, dandy True Random Number Generator chose comment 19 as a winner. That would be Lisa T. Congratulations Lisa, you earned a $25.00 shopping spree! If you want to meet Lisa, pay her a visit on her blog Mrs. Tilmon Says… She has a lot of good stuff! « Quarter of a Million!